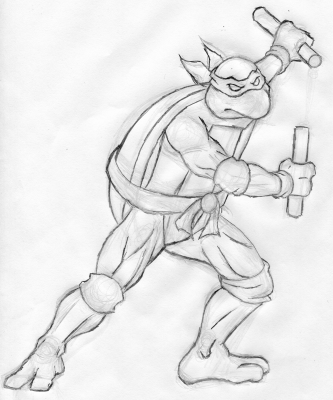 I wanted to make new and better sprites of the TMNT during the Revenge of 1989 (the debut year of both the arcade beat 'em up classic and the side-scrolling action game for the NES. I've been trying to find a sweet spot that intersects with the 1980s cartoon, the arcade game's look and my own spriting style. I asked people to vote for the Turtle they wanted to see first in their fight stances from that arcade game. Raphael won and Mikey was a close second, and that's why you see them there now. Don and Leo were done in the same ScrollBoss work batch to finally get this new-style green machine finished. The "calm stand" sprites were done in 2016. The 2009 sprites were made during "The Revenge of 1989" theme month for my ScrollBoss video game fan site. 2009 is the 20th Anniversary of their arcade game and the 25th Anniversary of their creation so I had to make sure the Turtles joined in on the act. These are in the same scale as most of the later Capcom fighting games. I made a multi-layered template to make different characters with different expressions, weapons, belts and more.